This is the third of a five-part series of posts about the McCree values of CARES, the glue that binds us. Our values are the foundation to building relationships, projects, and our company so all are Designed & Built Right. The CARES acronym reflects our culture, brand, and customer experience. “We say what we mean. We mean what we say.” This no-nonsense, factual, and direct approach is the simplest and best way we’ve found for living life, doing business, and guiding owners through the development process. You have a dream you want to build. When you come to us with a concept for your new workspace, you’re imaging all the possibilities. It’s our job to dream with you, to listen and learn about your big ideas as well as the subtle nuances. Practically speaking, since our founding in 1926, we’ve never had a project with an unlimited budget. That’s where our value of “Realistic” truly comes into play. Everything is possible, but not everything is within the budget. We afford no room for hype or a place for false hope, yet we pride ourselves in helping your dream become a reality. Through our Concept to Key 10-Step Process we enter into a series of collaborative design and build iterations to get you to or as close to your dream as possible. Building ownership and development involves hard costs and real decisions. Many of these choices are difficult and involve trade-offs. In most cases, the implications of these choices may be foreign to you, but not to us. Because we’ve listened and learned on the front-end, we’ll guide you through the concept, design, and build stages so you can stay true your most desired end results. The tenderness of your vision along with the hard choices involved in construction eventually intersect with the realities of a budget, schedule, and standards. Trade-offs are inevitable. Once we get to this point, we afford no room for hype or a place for false hope. Engaging in a guided, collaborative effort with open book accounting identifies your specific needs and desired outcomes and ties them to the practicalities of budget, schedule, and standards. Working together early, often, and throughout mitigates surprises and reduces construction related risks for both of us for a win-win. The worst call you’ll get from your contractor is, “We’ve had a surprise. 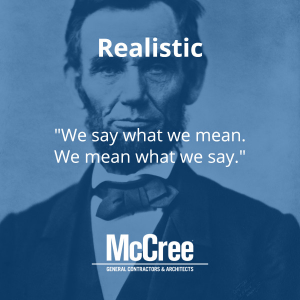 How do you want us to handle it?” While no firm is perfect, as your construction professionals, we bear the brunt of the construction risk “surprises.” A “no surprises” experience is a McCree point of pride! Thanks to multiple value engineering cycles, the scale, scope, and potential surprises associated with your land, regulators, design, and build are anticipated and communicate to you in advance of investment. Constancy of contingency planning mixed with our experience means we’re rarely surprised. This means you’re even less surprised because when the unexpected does arise, in the vast majority of cases we just handle it for you. We don’t play games with your emotions or your pocketbook. We don’t tell you what you want to hear in order to win your business but risk losing a relationship with you and tarnishing our family name and reputation. Realistic means we work with the facts, being neither overly optimistic nor pessimistic. When we error, we error toward the conservative so promises made can be promise kept. Your single most important construction decision is who do engage to help you. Unless you are highly experienced in architecture and construction, a decision to construct thrusts you into unfamiliar territory and a vulnerable position. Before you hire your architect or contractor, please do your due diligence. Going a bit slower on the front end of your selection process, can gain you speed, peace of mind, and confidence throughout the remainder of your project. After all is said and done, being realistic with one another is the best way to do business.